A ray of sunshine, in the late summer afternoon, illuminates for a few minutes a tuft of leaves clinging to the grating of the garden. Strong colors, wild, warm, which arouse emotions and surprise the eyes of the viewer, incredulous of so much splendor, that carefully observes, closely, every detail, every leaf full of that macilento color. 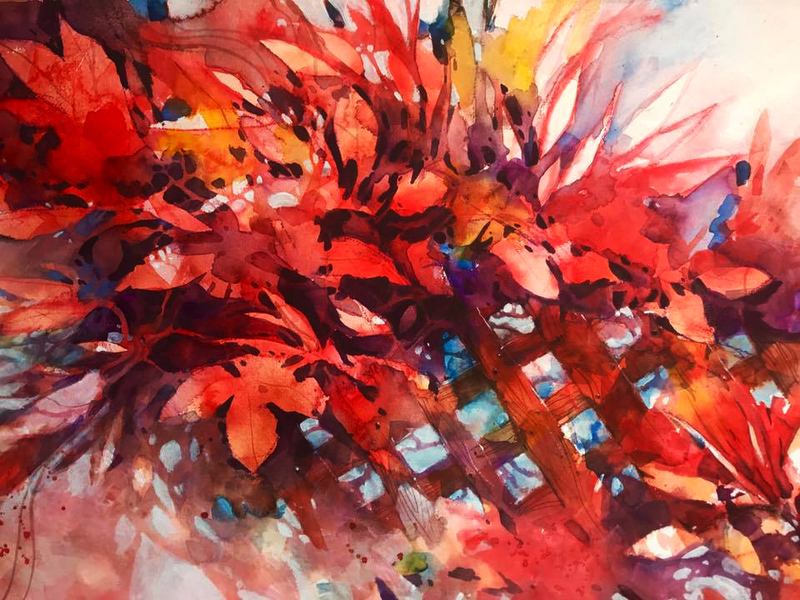 It is an explosion of sudden colors, wild spots of red pigments clinging around the boards of the old wooden grate beyond which the blue sky can be glimpsed. Autumn falls and blankets are more than ever for a moment have shown the world their vitality. Wonderful art! Congratulations! Isn´t the paper from Lorenzo Santoni wonderful? It became my favorite paper since I had the first chance to try it. Thank you so much! Yes this paper is great for painting in watercolor. Early I was using Khadi indian paper but now I preferì this one from Lorenzo.